Zeke started his Intermediate class last night. We were supposed to have it with Michael teaching (the trainer from our beginner class) but he had a bad accident with a ladder and is out of commission for awhile. Here's hoping to a speedy recovery for you, Michael! Here is Betty Blue a shepherd mix and her momma. Week one is working "sit" with distractions and "wait". Zeke is pretty good with wait... distractions are another thing all together. 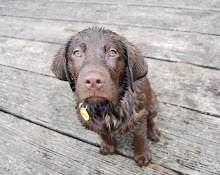 There is the potential for a couple more chocolate labs to join up with the class. Which would of course be awesome.